Friday the 10th June marks the launch of the Summer Breeze Exhibition featuring the work of two of Hookedblog's current favorites Malarky and Billy. Having spent the last few months decorating East London shutters, trucks, walls and rooftops with their vibrant neon colour palette and crazy characters, the two artists will now bring some of that energy indoors for a joint show at the High Roller Society Gallery. The Summer Breeze exhibition is set to feature new canavas and prints works from both artists as well as a number of collaborative pieces. Raised in South London, Malarky’s style is influenced by a combination of the multi-cultural surroundings of Brixton, and the laid-back vibes of sunny Barcelona where he spends half his time. 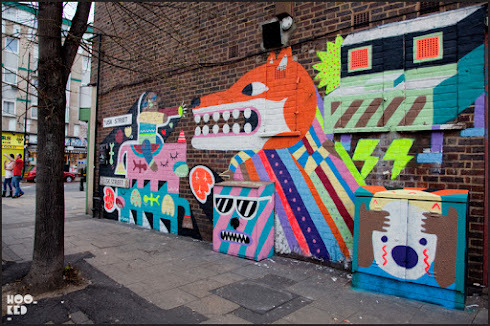 Malarky’s trademark foxes pay homage to his home turf where the animals roam freely around the city streets at night, echoing that of his own evening escapades with the likes of Billy, Mr Penfold, Rowdy, and Mighty Mo. Childhood adventures in Africa fused with a background in graphic design influence Billy’s tribal-esque shapes and bright colours. 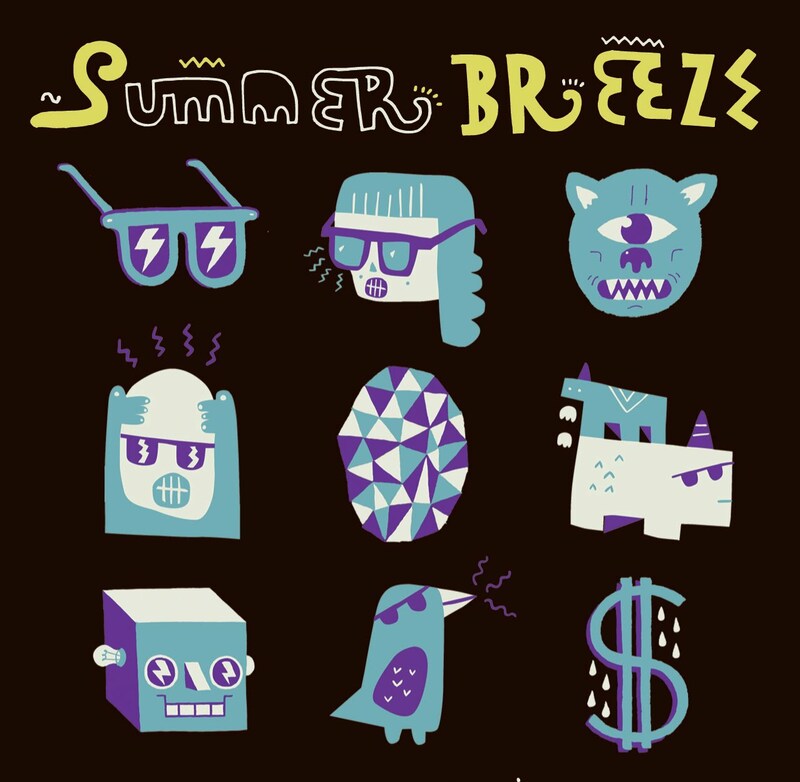 Billy incorporates funky typefaces and wild colour combinations to create a style that is abstract, bold and fun. Taking this on trips to colour up the streets, Billy is enjoying the positive vibes and community impact of drawing big and painting bigger in Brixton and beyond. The show opens with a summer party on Friday 10 June from 7pm, expect a night of silly, tasty, breezy, summer fun! The show will run at the gallery until the 3 July 2011.